Sidney John Thomas Blake was baptised at St Mary’s Church Ash Vale 3 February 1895. His parents were Sidney John and Frances Rosina Blake, who are listed on the 1901 census with seven children all born in Ash. Mr and Mrs Blake are recorded as living at 2 Montrose Villas, Vale Road, Ash Vale in the electoral register of 1918. Soldiers Died records that Sidney enlisted at Winchester. 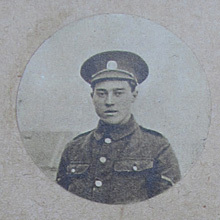 Three of Sidney and Frances Blake’s sons went to fight in the war, Gordon, Eddie and Sidney. Mr and Mrs Blake were vergers of St Mary’s Church until 1931, when their son Gordon took over. Sidney operated the bellows of the organ before electric bellows were fitted.